Bio Notes: Harry Anthony Wheeler was born on 7 November 1919, the son of Herbert G Wheeler who was a Londoner and a master engineer and who had established a garage in Stranraer, and his wife Laura E Groom. He was apprenticed to Alexander Maclean Goudie of Stranraer in July 1936, transferring to the office of Lennox & MacMath in Glasgow in September 1937 to continue his apprenticeship whilst studying at Glasgow School of Architecture. He went to France under a travelling scholarship in August 1939, a month before leaving Lennox & MacMath. He undertook military service in France, Holland, Belgium and Germany during the Second World War reaching the rank of captain by the time he was demobbed. After his return, in July 1946 he undertook a study tour in Italy under the Glasgow School of Art's John Keppie Travelling Scholarship, and in September he returned to the School. A successful student, during his studies he received other awards including the GSA's Bellahouston Travelling Scholarship, the RIBA's Grissell Gold Medal and Neale Bursary, and and the RIAS's Rowand Anderson Studentship. He received his diploma in June 1948. He was admitted ARIBA on 14 December 1948, his proposers being Gavin Lennox, Daniel Walter MacMath and Professor William James Smith. His endorsement on his nomination papers describes him as the 'most outstanding student of this year'. At that time he gave an address in Stranraer, but before the year was out he had moved to Oxford as Assistant City Architect. In 1949 (according to his FRIBA papers - though it seems the date may have been earlier) he secured another travelling scholarship that enabled him to travel to Switzerland, and in the same year he left Oxford for London to join the practice of Sir Herbert Baker & Scott. The following year he moved again, this time back to his native Scotland to take up the post of Chief Assistant to the Glenrothes Development Corporation. At some point he obtained a RIBA Diploma in Town Planning, and he was retrospectively awarded a BArch from the University of Sheffield. Wheeler was appointed senior lecturer at Dundee School of Architecture in 1952, and at the same time established his private practice as H Anthony Wheeler with an office at Sailor's Wharf, Kirkcaldy. Two years later Frank Sproson was assumed into partnership, the practice title becoming Wheeler & Sproson. The firm was active in the restoration work for the National Trust for Scotland under the Little Houses scheme and won many awards for their work. Wheeler also played a key role in the conversion of part of Falkland Palace into a private apartment for Major Crichton Stuart and for the conversion of Houston House into a hotel. In 1959 Wheeler was elected FRIAS, and by 1964 he was a representative of its Edinburgh chapter. On 19 July 1967 he was elected FRIBA, proposed by Robert Hogg Matthew, Alan Reiach and John Hardie Glover. His nomination papers list further study tours, to Israel and Greece in 1963 and to Finland in 1965. Further partners were taken on by the practice: Donald McInnes in 1965, Anthony Weir in 1967, and Alan Clark and William McLeod in 1975. Wheeler was a talented draughtsman and remained active in exhibiting work with the Scottish Society of Architect Artists. In August 2012 he was made an honorary fellow of the society. 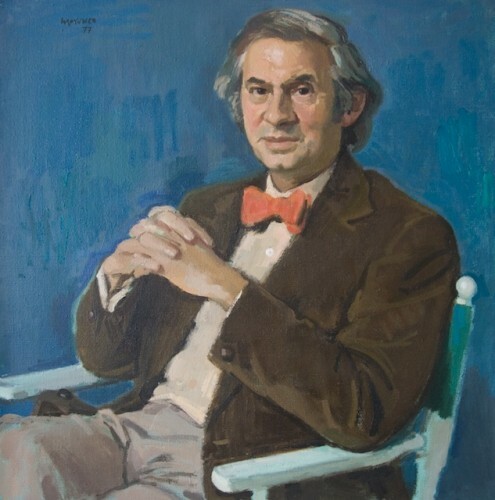 From 1983-90 he served as president of the Royal Scottish Academy. During his term in the office the Friends of the RSA and the RSA shop were developed. He also served on the Royal Fine Art Commission for Scotland and had a term as president of the RIAS. He received an honorary doctorate from Robert Gordon University. Outwith the professions he was a keen angler and loved music and theatre as well as being devoted to the Scottish countryside. He was a significant collector of Japanese prints. Falkland Palace Falkland Fife Scotland Conversion of part of the Palace into private quarters for Major Crichton Stuart. 1951 Woodside Shopping Precinct, Community Centre and Housing Glenrothes Fife Scotland As architect with Glenrothes Development Corporation. 1956 Ardwell House Wigtown Wigtownshire Scotland Removal of Baronial additions and new fron elevation. 1961 5, 6, 7 Rumford and 54 High Street Crail Fife Scotland Restoration (one of the first buildings restored under the National Trust's Little Houses Scheme). Nos 5 & 6 Rumford made into one house. 1970s Ninewells Hospital and Medical School Dundee Scotland Staff housing. In the RIBA Directory of 1975 this is given as 'nurses' quarters for SSHA'. Unclear if this is actually an error for ERHB or SERHB. 1970s Premises of James D Bruce Dunfermline Fife Scotland Reconstruction? 1976 43-67 High Street Dysart Fife Reconstruction of group of historic buildings and conversion into flats. 1978 Path House Kirkcaldy Fife Scotland Restoration and conversion of 17th century house into nurses' home.